This afternoon the Oklahoma Senate Appropriations Committee will consider House Bill 3393, which provides school vouchers to students with disabilities (such as Down syndrome or autism). New polling data show strong support for the idea: likely Oklahoma voters favor school choice for special-needs kids by a margin of 55 percent to 39 percent. The margin is 54 percent to 39 percent among self-identified Republicans. However, at least one Republican is in the minority. According to the Enid News and Eagle, Shawn Hime, a candidate for state school superintendent, opposes school vouchers. What's the average teacher compensation in the Milburn public schools? How does this compare to the market-determined teacher compensation in the private sector? (My guess is it's nearly double.) Given the student-achievement levels in the district, are these salaries deserved? Milburn's school superintendent oversees 210 students and earns a base salary of $66,580. How does this compare to the market-determined salaries of comparable administrators in the private sector? And given the student-achievement levels in the district, is this salary deserved? As state lawmakers consider providing scholarships for students with disabilities (such as Down syndrome or autism), new polling data show strong support for the idea. Likely Oklahoma voters favor school choice for special-needs kids by a margin of 55 percent to 39 percent. A scientific telephone survey of 1,000 likely voters registered in Oklahoma was conducted February 25 through March 8, 2010 by SoonerPoll, the same firm that conducts the "Oklahoma Poll" for the Tulsa World. The poll, which was commissioned by OCPA, has a margin of error of plus or minus 3.1 percentage points. "A proposal has been made to allow special-needs students currently in public schools to enroll in private schools chosen by parents with government helping to pay the tuition. Would you support or oppose this proposal?" There are signs that "the Democratic base has begun to sour on the teachers unions," Cato Institute scholar Andrew Coulson wrote yesterday. Davis Guggenheim, director of Al Gore's An Inconvenient Truth and an Obama campaign donor, recently debuted his documentary Waiting for Superman highlighting the virtues of school choice, and faulting the unions for their obstructionism. It won the documentary audience award at the Sundance Film Festival and was promptly picked up by Paramount Pictures. If national Democrats continue to ignore these tectonic shifts ... among the cultural vanguard of the Left, they will soon lose a key political asset: the public's perception that they are the party of education. Earlier this week I pointed out that Oklahomans, by a 2-to-1 margin, don't think spending more money on public education will translate into better student performance. Looking closely at the cross-tabs, the pollsters teased out an interesting nugget: the older the poll respondent, the stronger the belief that more money won't help. Last week I mentioned new polling data showing strong support for the idea of giving school choice to special-needs students. Well, those same data also show that Oklahomans favor, by a margin of 59 to 37, the idea of giving school choice to low-income students. A scientific telephone survey of 1,000 likely voters registered in Oklahoma was conducted February 25 through March 8, 2010 by SoonerPoll, the same firm that conducts the “Oklahoma Poll” for the Tulsa World. The poll, which was commissioned by OCPA, has a margin of error of plus or minus 3.1 percentage points. That tradition is alive and well in Oklahoma, and indeed is the animating spirit of the teacher unions' push for State Question 744, the so-called HOPE initiative, a proposed constitutional amendment that would require the state legislature to increase per-pupil spending to the regional average. Granted, the education system needs money. You're going to need money — lots of it — when you pay above-market prices for everything from skillets to schoolteachers. News9 recently reported that one Oklahoma school district spent $10,600 for a large skillet. Oklahoma's state auditor reported that another district paid $540 for three mop heads valued at $13.50. And of course public-school teachers on average are paid more than the market-determined teacher salaries in the private sector (both nationwide and in central Oklahoma, according to the Bureau of Labor Statistics). What 744's boosters need to explain to weary and wary taxpayers is this: How, exactly, is more money going to help? Because Oklahoma voters, by a stunning two-to-one margin, don't think it will. A scientific telephone survey of 1,000 likely voters registered in Oklahoma was conducted February 25 through March 8 by SoonerPoll, the same firm that conducts the "Oklahoma Poll" for the Tulsa World. The poll, which was commissioned by OCPA, has a margin of error of plus or minus 3.1 percentage points. "Now I'm going to read you a statement," the surveyor said. "Please tell me whether you agree or disagree: If more money is spent on public schools in my district, students will learn more." Only 32 percent of respondents agree with that statement, while 64 percent disagree. Even Oklahoma Democrats (39 percent to 57 percent) don't think more money will improve student learning. Oklahoma Republicans (24 percent to 70 percent) are more emphatic. As it turns out, this pessimism is warranted. Cato Institute scholar Andrew J. Coulson recently investigated the relationship between spending and student achievement in our state. He used ACT scores as a measurement because the NAEP scores for high-school students aren’t broken down by state. "Oklahoma's participation rate in the ACT is high (between the mid 60s and low 70s), hasn't fluctuated wildly over time, and is not significantly correlated with its actual scores (I ran a regression to find out), so it's a reasonable measure," he explains. "I've only carried it back to 1990 because the ACT was redesigned in that year, making the scores discontinuous." As you can see in this chart, since 1990 — which, incidentally, is the year HB 1017 was signed into law — spending has risen dramatically while performance has remained essentially flat. When reality is this sobering, I guess you can't blame folks for clinging to HOPE. Now I suppose we could pass SQ 744 and, magically, things could be different this time. Perhaps, for once, pouring more money into a heavily unionized, government-owned-and-operated monopoly would prove to be a wise use of resources. Sort of like pouring more gasoline into a truck with a blown transmission. Heck, for all I know Lucy van Pelt might actually hold the football long enough for Charlie Brown to kick it next time. The unions can always HOPE. The late teacher union boss Al Shanker once famously remarked, "When school children start paying union dues, that's when I'll start representing the interests of school children." Gotta love the candor. Shanker was, after all, president of the American Federation of Teachers. Comes now a new organization representing the interests of school children by working to give them more options via vouchers, scholarship tax credit programs, and charter schools. The group's name? American Federation for Children. In the current issue of The Cato Journal, Neal McCluskey takes aim at "the factually dubious assertion that education -- especially government-run education -- has always been understood as essential to the survival of a free, American republic." From the early colonial period well into the 19th century -- when the nation was formed and its foundational principles established -- there was little "public schooling," as we would define it today, with no states having compulsory schooling laws and education primarily conducted in private or voluntary community settings. Moreover, most early Americans simply did not envision a major government role in education, nor did they see schooling as critical to a free society. Indeed, in his lifetime Jefferson never got even the rudimentary public schooling system he wanted for Virginia because too few Virginians supported it. This is not to say that the education that occurred -- and there was much of it -- did not teach children a common, American culture. Look no further than sales of the famous, intentionally "American" spellers of Noah Webster. By 1829, 20 million copies of the spellers were in circulation, though the entire population of the United States was less than 13 million. And they were ubiquitous because people freely bought them. According to the latest research on education spending and economic growth, "an analysis of combined higher and K-12 education spending yields an overall negative effect." As state lawmakers consider providing scholarships for students with disabilities (such as Down syndrome or autism), new polling data show strong support for the idea. Likely Oklahoma voters favor school choice for special-needs kids by a margin of 55 to 39. 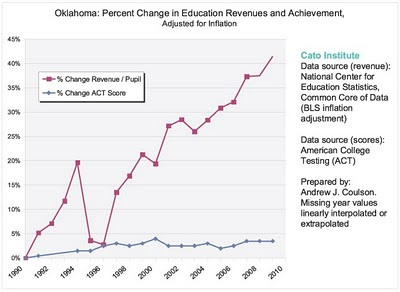 Three times in the last five years, OCPA has shown that the real cost of Oklahoma's public education system is substantially higher than the "official" cost given by government officials. "We moved our family, our businesses, and our local spending" to a new state because it has school choice, one mom wrote yesterday. Indeed, "school choice could be used as part of a marketing plan to attract small businesses to rural Vermont. It was the deciding factor for us." With her nearly 22 million page views per month, Osage County blogger Ree Drummond finds herself on Forbes magazine's Web Celeb 25 list of "the biggest and brightest stars on the Internet." She blogged yesterday on why she homeschools her children. The entire post is worth reading, but one benefit she mentioned was "the sheer amount of time we get to spend together as a family." I do sense a real connectedness that has formed in our household over the past few years. There's a sense that we're a team, that we're all in this together, and that any learning that needs to be done around here is a group effort. does not ensure that special education teachers have subject-matter knowledge. Yesterday's vote was the second time in two weeks school-choice supporters have had reason to cheer. On February 16 the Senate Finance Committee approved Senate Bill 1922, a school-choice tax credit bill authored by Sen. Dan Newberry (R-Tulsa). That bill now advances to the full Senate for consideration. UPDATE: The FOX 25 story on the special-needs scholarships bill is here. A NEWS9 interview with Rep. Jason Nelson is here.